Dailey & Vincent may be the biggest stars in bluegrass music. The three-time Grammy nominated duo has performed at iconic venues from coast to coast and last year took their family friendly show to the seas for the Dailey & Vincent cruise. They aren’t making new country music by any stretch of the imagination, but what they are creating is soulful music that makes you feel good. Their new album, ALIVE! In Concert, is available now exclusively at Cracker Barrel stores and online at crackerbarrel.com. On it you’ll hear songs never before released by the duo including the powerful “American Pride.” We talked with the superstar duo to find out what went into recording this live album. 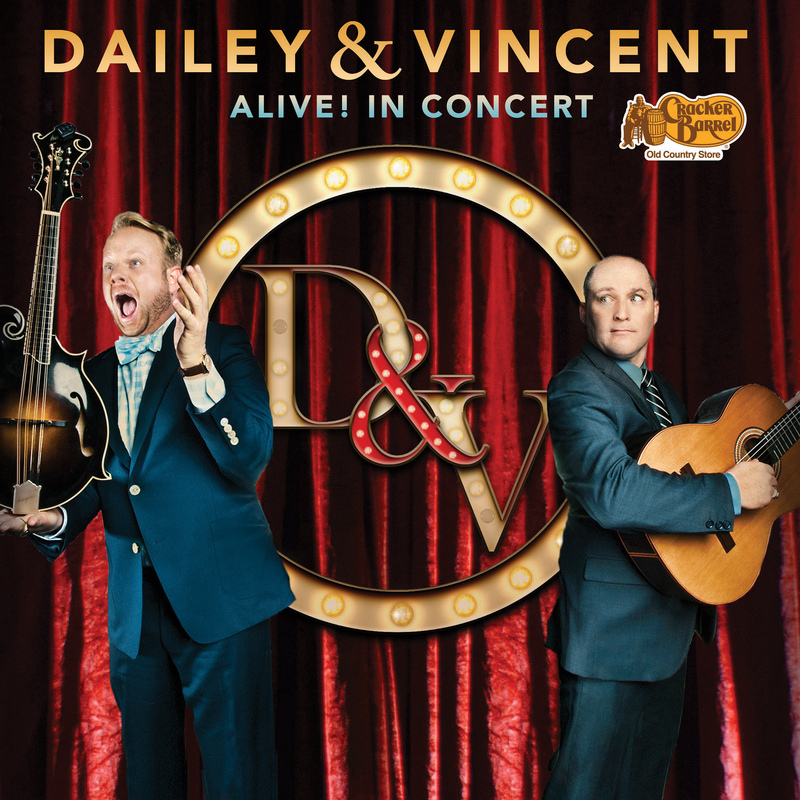 For people unfamiliar with Dailey and Vincent’s music how would you best describe it? American music, roots music, and with us it comes from the heart. Something that any music fan, regardless of genre, is well aware of is the Grammy Awards. You guys have been nominated for a few of these awards, what do those nominations mean to you? It’s cool because we’ve been nominated at the Grammys in three different genres. The first nomination came during one of our biggest years as a band, and we received a country music nomination. The next year we came in with a Gospel music nomination and the third year we came in with the bluegrass music nomination. So we’ve covered three genres and I’ll tell you, it’s a pinch me moment. We couldn’t believe we even got one nomination, let alone three. So it’s all very touching for us. Do three nominations across three different categories give you guys an added confidence boost that you can succeed in a wide variety of genres? It just gives you confidence to want to go in and create a better project that people will enjoy. We have the fan base that reacts instantly from the songs that we do every night, but to try to get the industry – the voting members – to do that is a whole different ballgame. So we get in the studio and record our best performances and hope that it’ll resonate through the industry as much as it does through our fan base. The new album that’s available now exclusively from Cracker Barrel features some tracks that haven’t been released as studio versions correct? So one of my favorite tracks on the album is called “American Pride” what can you tell us about that song? It’s a song that I had an idea for, for a long time and I called whispering Billy Anderson from the Grand Ole Opry and Statler brother Jimmy Fortune and told them the idea. So we met at Sony Nashville and Bill went to the bathroom and came back and said I have the name of the song, “American Pride.” So we took off writing it from there and within about three hours we had it written. We did it on stage about three weeks later to a sold out crowd in Franklin, North Carolina. Halfway through the song the whole crowd stood on their own without any motion for them to get up out of their seats. They did it all on their own. We couldn’t believe what we were seeing, it was pretty cool stuff. Yeah, it’s definitely a powerful track. Even listening in the car or something it’s the kind of song that can really empower you to get out there and do something. Talking more about the album, take us back to the night the album was recorded. What stands out from that night? It was a big night, we had a lot of our friends and family there which makes it an emotional night. But it’s also a stressful night, but we spend so many years dreaming and hoping for this opportunity it was a bit overwhelming for us. We were thankful for it and excited to get out on stage and see what people thought of our new music. It was really a roller coaster ride. You mention the stress, would you say there’s extra pressure knowing that you’re being recorded up on stage? It was very stressful. Of course there was new music, but you also had to know where the cameras were going to be for the DVD. In fact at the end when we’re about to take things home you can’t really find Darren because I’m over there talking to people in the front row. So I messed that part up, but it was a lot of fun. Now when something like that happens are there people in your ear telling you get back in the shot? No there was nobody in my ear, but when you go back and watch it Jaimey goes “where it you go?” I was just off talking to the folks in the front row, having a good conversation. I never even realized it until they started editing it and they were like if you guys could have gone down there together it would have been a little better. But I missed that. We’d like to thank Dailey & Vincent for taking some time to chat with us. You can follow them across all forms of social media: Twitter, Facebook, YouTube, or check out their official website.